The museum has been busy all of 2005 and we haven't slowed down for the new year. For starters we ended the year by carrying 13,014 passengers, which makes 2005 our sixth straight year of increased passenger load. The other interesting part of the 2005 passenger picture is the month of December. In December, we carried 1,265 passengers. December was our fifth heaviest month of the year and if we had carried just 14 more passengers, it would have been the fourth busiest month edging out September. Of course, this is due to the Polar Express trains and I expect that business to grow. By 2007 or 2008, December could easily be our second busiest month of the year. As a side note, about 90% of the passengers for the Polar Expresses were from out of town with the vast majority being from the Las Vegas area. A fair percentage of our Las Vegas visitors had never seen snow! And Mother Nature obliged several times during the Polar Express season, where the Polar Express loaded up during a snowstorm. We actually had to use the Men's Waiting Room as guess what?a waiting room. Locomotives 40 and 93 in front of the East Ely Depot captures a timeless scene from the heyday of the Nevada Northern Railway. Photographed February 2006 by Steve Crise Photoproduction. Running the Polar Expresses is tough on the staff and the volunteers. Maintaining, servicing, and operating a steam locomotive at or below freezing temperatures calls for close attention to detail. As you know water freezes at 32 degrees. What you might have forgotten is that water expands as it freezes. When water freezes, it has enough force to split metal pipes and metal castings. Since everything on the locomotive runs off steam, the engine crew must pay close attention to the locomotive so that nothing freezes. The shop staff spent the fall preparing locomotives 93 and 40 for the Polar Expresses by installing drain valves all around the locomotive, this helps to drain the water out at night. Because of this proactive stance both 93 and 40 came through with flying colors. Winter operations take a lot out of the people involved. It doesn't matter whether they work in the gift shop, the office, in the shops, on the equipment, or out on the tracksit is cold. The gift shop and the shops have something in common during the winter: both are cold. The heaters in both locations are not strong enough to overcome the winter temperatures and both locations are chilly at best and down right cold at worst. People think that crews in the steam locomotive cab are warmthey're not. The cab is open to the tender and the crew generally needs to keep the windows open to see where they are going. The wind just whistles through the cab. Of course, the track department may have it the toughest. When it snows, they need to keep the switches clear so that the switches work. They also need to keep the road crossings clear so the trains don't derail. They work in the great outdoors where it's a lot of manual labor. The museum actually ended the year by running Polar Bear trains the week between Christmas and New Year's. That was new for last year. It did okay and the Polar Bears have a lot of room to grow. We started the year by operating the last three weekends in January. These operations supported the Fire and Ice Festive out on Cave Lake, The VFW Winter Encampment, and the Rotary's Ice Fishing Derby. During the second weekend in January, we had a music video shot on the railroad. The video crew was very impressed with the railroad, the scenery, and the way the staff and volunteers accommodated their needs. This now brought us to February and the winter photo shoots. The museum in cooperation with Joel Jensen sponsored two photo shoots. In between our two shoots, the Heber Valley did a photo shoot, too. This was the first year that the two railroads worked together and it was the first year that the museum here sponsored two shoots. It was a risk, but the three shoots were a smashing success. The shoots on the Nevada Northern featured locomotives 40 and 93. Locomotive 40 pulled her original train of Baggage/RPO car 20 and First Class Coach 5. Locomotive 93 pulled a mixed ore and freight train. New for this year were three repainted and lettered boxcars. The lettering is not quite complete but the cars look wonderful. On Sunday of both shoots, we fired up the steam crane and gave a demonstration of its capabilities. We also pulled out the rotary snowplow and had locomotive 93 do a couple of runbys with it. Then just after Valentine's Day, we had a photo charter. Twenty-eight photographers from Great Britain traveled to Ely to photograph the Nevada Northern. 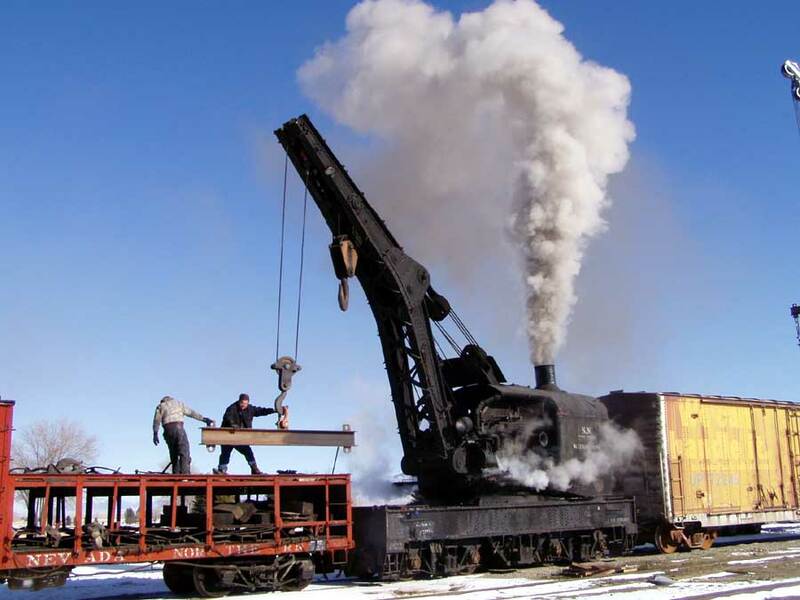 Speaking of the steam crane, it was invaluable twice this winter. The first time was to unload two, fifty-foot, metal boxcars. The museum was given two boxcars. We accepted them because we need storage. One boxcar will be used as storage for the Locomotive 81 project and the second will be used for the materials that are in the wooden boxcars. The two boxcars were unloaded using the steam crane and the diesel-electric, Brownhoist crane. The wheel lathe came in three semi-truck loads. The staff, volunteers, and honor camp used the 99-year-old steam crane to unload the pieces and place them on three flat cars. The heaviest piece was the thirty-ton base. Naturally, the semis showed up on the coldest days we have experienced so far this year. It is pretty impressive to watch the crane at work in the cold. The crew is putting away the rigging. The crane just unloaded the boxcar that is behind it. If you look closely, you can see on the boxcar, "We can handle it." Sort of sums up the ability of the staff and volunteers of the museum. The honor camp has been working on a couple of other projects for the museum: they have completed the residing of a boxcar, dug out a couple of the drainage vaults, replaced broken windows, and cleaned up the boiler shop. Their assistance to the museum has been invaluable. Now that the photo shoots are over, its time to continue with the work to prepare the complex for the Centennial Celebrations in September. Locomotive 40 is now out of service. She will be moving into the machine shop to under go her annual inspection and for some repairs. With luck, she'll be back in service by July 1st. Speaking of the Centennial, the 2005 Centennial Coins are almost sold out. The museum plans to mint three Centennial Coins: 2005, 2006, and 2007. The 2005 coin commemorates the starting of the railroad in 1905. The 2006 coin commemorates the arrival of the railroad to Ely in 1906, and the last Centennial Coin (2007) will commemorate the arrival of the railroad to the mines in 1907. So if you want a complete set of the three coins you had better act now. Once the 2005 coins are gone, they're gone. So where the museum may seem quiet, we're actually busy as beavers. There is ton of work to be done. So if you're bored come on down and volunteer.